Most people ignore the back or posterior teeth because they assume that no one will see them when they smile. However, the posterior teeth are just as important as your front teeth. Just because you can’t see them doesn’t mean any issues that exist will disappear. What happens when you don’t replace back teeth? When you fail to replace your missing back teeth, you risk losing the surrounding bone that supports them. With poor bone quantity, treatments like dental implants have a low success rate. Missing back teeth can also cause chewing problems. This can eventually have a negative impact on your diet because you wouldn’t be able to take certain foods which your body needs. Missing back teeth can also have aesthetic impacts on you. Your face, cheeks and lips may begin to sag because of the extra space. This is why old people with no teeth have a saggy face. The other issue that occurs when you fail to replace the missing back teeth is teeth erosion. Because the front teeth are receiving a lot of stress, they begin to wear out excessively. The missing back teeth can also cause tipping, migration and rotation of the remaining surrounding teeth. TMD disorders can also occur because of loss of posterior teeth. In a nutshell, the loss of back teeth can result in issues that affect the gums, jaw muscles, joints and ligaments. If a tooth replacement is not done for the back teeth soon, you may not have adequate room to replace them when the time comes. This is because of an abnormal displacement of tooth in the jaw bone because the teeth have shifted too much. In fact, this movement of teeth has a bad impact on bone health. It changes the way the jaw bone is attached to the tooth. The tooth is then left vulnerable to all kinds of gum disease. There are different forms of replacement for back teeth that your dentist may recommend. Most dentists will recommend implants as a suitable option. With implants, the adjacent tooth will not be affected. Furthermore, a dental implant is very easy to keep clean since they are placed to mimic your natural teeth so regular brushing and flossing will do. You never have to remove them every day in order to make sure they are clean. The major reason why dental experts recommend implants is that they offer a reliable and long term replacement for missing back teeth. However, before you are considered a good candidate for dental implants, you must have adequate bone height and volume where the implant is supposed to be placed. 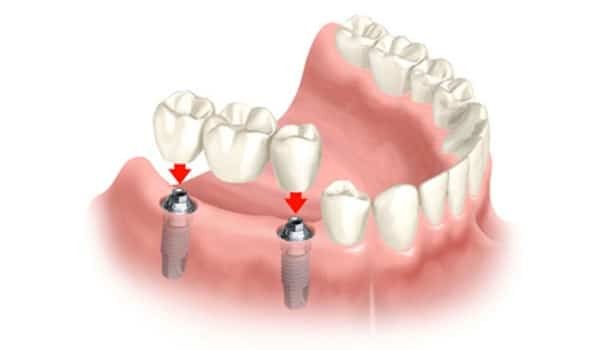 If you do not have the bone quantity and bone quality that is required for implants to be placed, the other alternative that your dentist may recommend is a fixed bridge. Fixed bridges can only be placed when teeth are present on both sides of the missing teeth. However, the adjacent teeth can be exposed to gum disease because they have to be drilled down for the bridge to be placed.